This paper provides an overview of the work done at the Centrum Wiskunde & Informatica (CWI) and Delft University of Technology (TU Delft) for different tracks of TREC 2013. 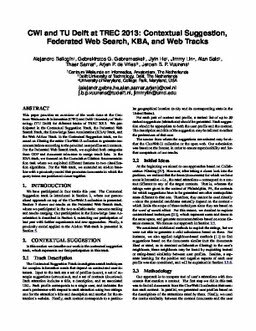 We participated in the Contextual Suggestion Track, the Federated Web Search Track, the Knowledge Base Acceleration (KBA) Track, and the Web Ad-hoc Track. In the Contextual Suggestion track, we focused on filtering the entire ClueWeb12 collection to generate recommendations according to the provided user profiles and contexts. For the Federated Web Search track, we exploited both categories from ODP and document relevance to merge result lists. In the KBA track, we focused on the Cumulative Citation Recommendation task where we exploited different features to two classification algorithms. For the Web track, we extended an ad-hoc baseline with a proximity model that promotes documents in which the query terms are positioned closer together. Bellogín Kouki, A, Gebremeskel, G.G, He, J, Lin, J.J.P, Said, A, Samar, T, … Vuurens, J.B.P. (2014). CWI and TU Delft at TREC 2013: Contextual Suggestion, Federated Web Search, KBA, and Web Tracks. In Text REtrieval Conference.